Taking a cue from Sam Raimi's wildly successful "Spider-Man" movies, writer David S. Goyer ("Blade" and its sequels) and co-writer/director Christopher Nolan ("Memento," "Insomnia") delve deeply into Bruce Wayne's psyche in "Batman Begins," a fresh reboot for the fallen superhero franchise. Returning to the dark roots of the character, half the movie takes place before the stoic young billionaire even dons the now-bulletproof Batsuit, which Wayne eventually fashions from experimental body-armor built by Wayne Industries, the war-profiteering conglomerate once owned by his more altruistic late father. 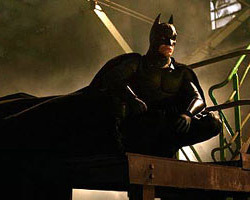 Played with portentous, anguished magnetism by Christian Bale ("The Machinist," "American Psycho"), and still haunted by his parents' murder when he was a child, Wayne begins the film the last place Batman fans would expect -- lost to the world in a Chinese prison after disappearing from a crime-gripped Gotham City. But he is sprung from this hoosegow by a shadowy ninja organization with a noble yet unrelenting master (Liam Neeson), who trains Wayne to channel his anger and defeat opponents with silent deftness and dexterity in beautifully photographed scenes (think swordfights on Tibetan glaciers) that pay homage to traditions of the samurai genre. Then a staggering betrayal puts Wayne on a path back to Gotham -- a vast industrial metropolis in the throes of a modern Depression and in the grips of the mafia -- with a determination to "turn fear on those who prey on the fearful." Bale and Nolan make their Batman almost like a slasher-movie stalker in the eyes of the city's villains, and you feel their panic as he attacks from the shadows or strings a thug upside-down off the edge of a building to interrogate him for information in a chillingly gravelly voice. Yet this Batman is refreshingly grounded in something resembling reality. His suit, tank-like Batmobile and other gadgets are all Wayne Industries' military prototypes (introduced by their caretaker Lucius Fox, played by Morgan Freeman). His wing-like cape is designed to work like a parachute for base-jumping. The Batcave beneath Wayne Manor is a cavern system once used by his anti-slavery ancestors as part of the Underground Railroad, we're told by Alfred the butler (Michael Caine), who raised the orphaned Bruce. Unfortunately, the pragmatic reinvention in "Batman Begins" is countered by several equally pedestrian blunders that hold the film back as if Nolan and Goyer were standing on the back of Batman's cape. The fight scenes are plagued by fashionable chop-edited close-ups, so it's impossible to discern what's going on until Batman is left standing over the groaning forms of defeated bad guys. Other times, near-armies of antagonists conveniently disappear from the script to ease a character's escape from danger. While Goyer's writing is generally potent and contemplative, there are moments of conspicuously clumsy exposition, and the flashbacks of Bruce's father (Linus Roache) so overplay the man's saintliness they run the risk of unintentional laughs. While Nolan revels in the brooding, serious side of Batman, he sometimes succumbs awkwardly to action-movie silliness (for some incredibly inefficient reason Batman has to lie on his stomach in the Batmobile to fire its weapons -- while still driving). And while Bruce Wayne's journey toward hero-dom provides the movie a strong psychological through-line, an emotional cheat is offered up in the form of a standard-issue former childhood sweetheart (Katie Holmes) who becomes a standard-issue damsel in distress. But where "Batman Begins" fails its serious side the most is in its epilogue that virtually ignores the extensive consequences and aftermath of its literally Gotham-engulfing climax. Nolan wants to have it both ways -- he wants his film to be dark, but not so dark as to discourage cheers from summer moviegoers when the credits roll. The result is a mixed tone that keeps this rebirth of Batman from fulfilling its potential greatness.